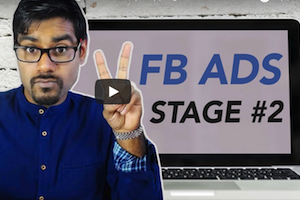 Today we cover Stage 2 of our Facebook Ads Strategy for Shopify Stores. Stage 2 focuses on taking you from $0 to your first $1,000 online. If you missed Stage 1, go back and check it out here. The system you’re about to learn has been tested on multiple fb ad accounts. Not only my own as well as Rito’s, but our clients as well. Remember, this is a numbers game. Leave emotion out of it. Scale what works, disable what doesn’t. The greatest challenge for dropshippers is finding the best product for a specific audience. The first thing you should do, is familiarize yourself with Facebook’s Advertising Policies. After you’ve thoroughly gone over their policies, create an audience of website visitors from the past 90 days. This audience of website visitors, will actually be excluded from your ads. Note – One Product. One Campaign. One Ad. Three Ad Sets. Interests will be the only thing that changes within each ad set. The final piece to phase 1 is preparing your ad creatives. In order to launch your ads, simply follow the FB Ads rules I’ve mentioned above. The only thing that will change for each ad set is the targeting. In order to better help you understand targeting, we’re going to divide interests into categories. Facebook suggestions will appear and help guide you. The second part of the FB Ads launch process is to duplicate your ads. Duplicate the ad you just created and modify the interests for each. 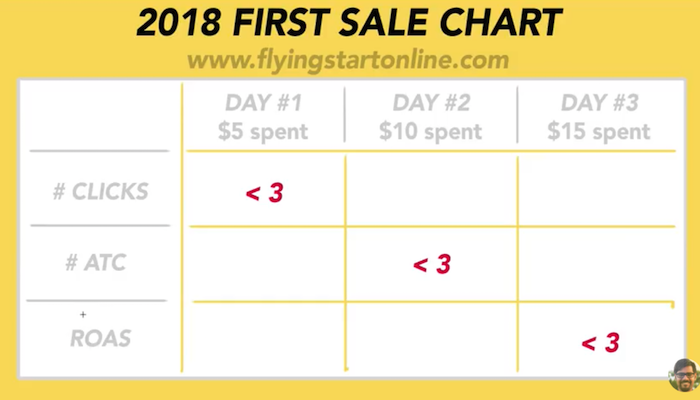 This final phase requires you to utilize our first sale chart featured above. The chart provides a no-brainer method to analyze every ad set you create from here on out. After the first day your ad is live, it should have spent $5. If the number of clicks on that ad set is less than 3 after 1 day, close that ad. After an ad has spent $10, but has not seen 3 or more add to carts (ATC) close the ad. Finally, after the ad has spent $15 dollars (day 3), but the return on ad spend is less than 3, close the ad. If you follow this guide, and stick to the numbers, you’ll begin easily identifying your winning products and ads. P.P.S. Click here for Episode 22! After Day 1 do you check the Link clicks or Clicks (ALL) in your adset? simple sweet and lucid…I got every single point you have mentioned..Now lets see how much time ll it take for me to get results from shopify ..thank you so much for your help. From past few weeks I am your biggest fan. I have started a shopify store few weeks back and your videos were so so helpful. I have just started my fb ads as you have shown in your first sale chart. So, far the results are not so promising but lets see what happens. Also I had a question, when you talk about ROAS, is it Mobile ROAS or Webiste ROAS? I can see these two different columns in facebook. In addition to that, I have a humble suggestion for this blog. Can you please have a numbered navigation below all your posts on homepage, so that people can go and read your backdated posts as well. Finally, I want to say Thanks for the effort you are putting in to teach such awesome things to people and that too free of cost. Take a bow! Thanks Again! You are just amazing. If i wrap up in one word then it ENJOYABLE .Seriously bro..You are funny plus a good teacher..I was looking for tips for my shopify..You saved me..Already subscribed your channel…thanx again. Your videos have helped me alot so far am able to create my store and understand facebook ads. Could you please tell me the exact names for the sale chat? 1) which clicks we talking about? COST PER WEBSITE ADD TO CART? WEBSITE PURCHASE ROAS(RETURN ON AD SPEND)? Can anyone tell me what are the full names in facebook adsmanager for the first sale charts ? Thank you so much. I have made $67.42 in my first 4 days of FB ads! I have a question though, I got a sale in the first day from an adset that had not done less than 3 link clicks, do I they continue to run the ad or cancel it per your rules? Amazing Ritoooooo I was following you since starting of 2018 and I learned a lot from you about Dropshipping thanks for it. Wow thank you so much for the continued support!